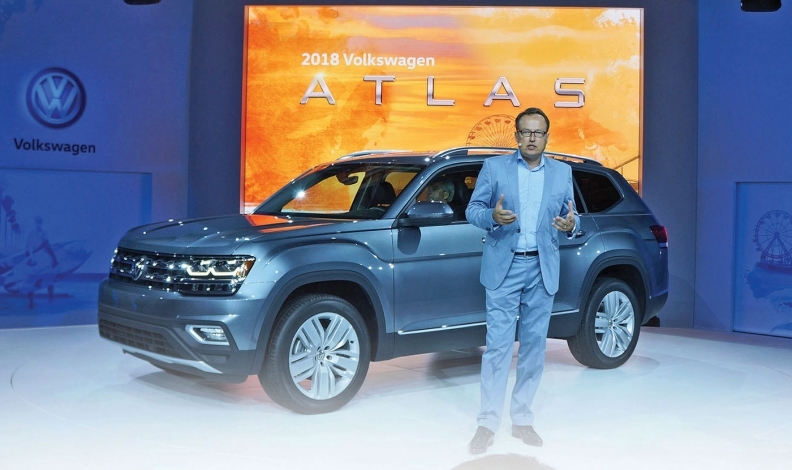 Volkswagen to build new five-seat SUV in U.S.
Hinrich Woebcken, CEO of the VW Group of America, at the Atlas unveiling last year. NEW YORK -- Volkswagen plans to build another new SUV at its U.S. plant in Chattanooga, Tennessee, as demand surges for larger vehicles, the automaker's top U.S. executive said on Wednesday. VW Group of America CEO Hinrich Woebcken told reporters at the New York auto show that the automaker planned to build a five-seat SUV in Tennessee, but he declined to say when production would begin. The news follows VW's 2014 announcement that the company would spent $900 million to build a new SUV in Tennessee. VW will start selling its new seven-seat VW Atlas crossover next month. Woebcken said VW was shifting focus in the U.S. from a mainly car brand to a "family friendly" automaker offering larger, U.S.-built SUVs. At the show, major automakers said they expected the popularity of SUVs and crossovers to increase in the U.S. The share of crossovers and SUVs among total U.S. light vehicle sales rose to nearly 40 percent in 2016 from 32.6 percent in 2014. Woebcken would not say whether VW would add additional workers in Tennessee to build the new SUV. VW will sell four separate SUVs in the U.S. later this year -- a figure that does not include the new one. The company said on Tuesday that it would continue selling the current Tiguan as the "Tiguan Limited" for several years even as it plans to offer a completely new, larger version later this year. The company also announced it was offering an industry-leading six-year, 72,000-mile warranty on its new SUVs. As part of its diesel emissions settlement, Volkswagen has agreed to add at least three additional electric vehicles, including an SUV, in California by 2020 and must sell an average of 5,000 electric vehicles annually there through 2025. Woebcken said he hopes that decision will help boost the company's image in the U.S. VW has agreed to spend up to $25 billion to buy back vehicles and resolve claims from U.S. regulators, dealers, owners and states.